Be constructive. If you’re stuck in the car for a long stretch maybe it’s time for a sing-along. Or you can distract the cranky one with a game of I’m Going On a Picnic. Or you can start the Fortunately/Unfortunately game. UNfortunately we are stuck in traffic because of construction. FORTUNATEly our car was retrofitted with monster truck wheels and we could just drive over all of those cars if we wanted to. This is an opportunity to teach your children a life skill. We are all faced with situations that could easily be trying in our lives. It is our choice to turn them into a positive experience. A road trip is a great time to practice these skills. 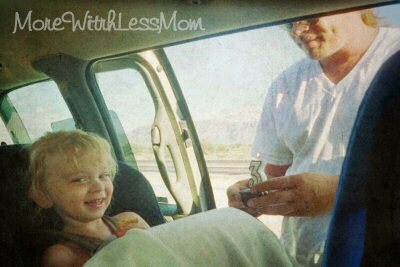 Also tantrum avoidance is a big part of being able to enjoy a road trip. The things that make little ones melt down can make even adults cranky, so it is best to take preventative measures whenever possible. Some of the top causes of tantrums are hunger, tiredness, too cold or hot, frustration, and overstimulation. Most of those are basic needs that you just need to put a little thought into to avoid. Frustration and overstimulation take a little more effort to prevent. You should know some of your child’s triggers and be able to avoid most negative situations. When you stop pull out anything you need to avoid those triggers for the next leg of your trip. One of the ways you can avoid frustration in a preschooler is to offer them choices. They can’t feel frustrated that they got the blue car if they picked that one. Let them pick the next CD, pick the next package from the surprise basket, pick which stall to use in the bathroom. Let them pick the snack you have next, the game you play, the activity from their Binder of Fun. Let them pick who will sit next to them for the next leg, and only exclude the driver from their choices, including no one if you have an extra seat. If you want to have a real adventure let the little one pick your route. Overstimulation is hard to avoid. You should know when your child is getting cranky and try to direct their activities to more calming things. Save the really loud, distracting toys for when they are fresh and happy. Save a good activity for when you know your child will be struggling. 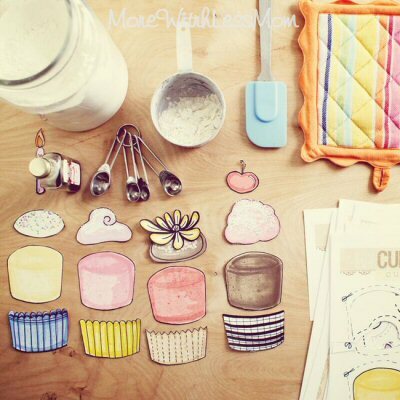 I save the Build Your Own Cupcake activity for when the three year old is getting testy. She loves this activity. She spent a long time last trip playing with this, asking everyone what flavor they wanted this time, etc. If you know you’re coming on to nap time when you stop you may want to pull out a quiet activity or two, like threading straw pieces on string, pipe cleaners , or dyed pasta. If your child will fall asleep to The Tigger Movie it might be a good time to make sure the DVD player is set up and charged or plugged in, headphones are accessible, and the movie is in. Make sure your child at least tries to go potty at the rest stop before nap time, especially if they are newly potty trained. I know my one year old will scream bloody murder as soon as I lift her towards her seat, let alone get her strapped in. But once we get going she stops. So I will do everything else I can, get everything prepped and everyone else in, then put the little monster in. Then we can just go and my blood pressure can have less time to skyrocket. *Note the pillow separating the cranky littles in the title graphic. Don’t underestimate the value of a little personal space. How do you keep the peace and keep yourself positive? Great post! I’m excited for the other posts in the series. 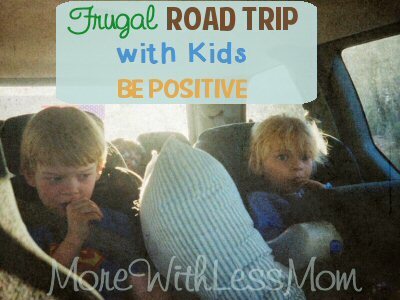 We’re taking our first official road trip with kids later in the year, and I’ll definitely be using these posts to help us make it great for everyone! Thanks for linking to my site, too!